Introducing the new flagship lens of the Sigma Sports line. 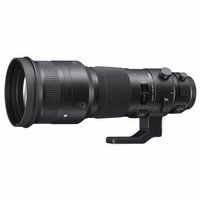 Alongside a dust- and splash-proof construction, the portable and durable Sigma 500mm f4 SPORT DG OS HSM Lens features an Optical Stabiliser (OS) system, compatibility with Sigmas teleconverters, a Hyper Sonic Motor (HSM), and top-level optical performance. This lens sets a new standard for high-performance telephoto lenses.